CAMBRIDGE — They’re not making careers like Robert Brustein’s anymore, if they ever did. Founding artistic director of two of the leading regional theaters in the country, the Yale Repertory Theatre and the American Repertory Theater. Provocative and influential drama critic for The New Republic for half a century. Dean of the Yale School of Drama, where he became an early champion of such students as Meryl Streep and Christopher Durang. Author, teacher, director, playwright, sometime actor, and mentor to many who became artistic directors themselves — among them Jeff Zinn, Kate Whoriskey, and Steven Maler. When he first arrived in Cambridge in 1980 to establish the ART after a much-publicized falling out with new Yale president A. Bartlett Giamatti, Brustein made no secret of the fact that he did not see the Boston area as a hotbed of adventurous theater. He set out to change that with a resident company that at various times included Tony Shalhoub, Cherry Jones, Karen MacDonald, Thomas Derrah, Remo Airaldi, Jeremy Geidt, and Alvin Epstein. 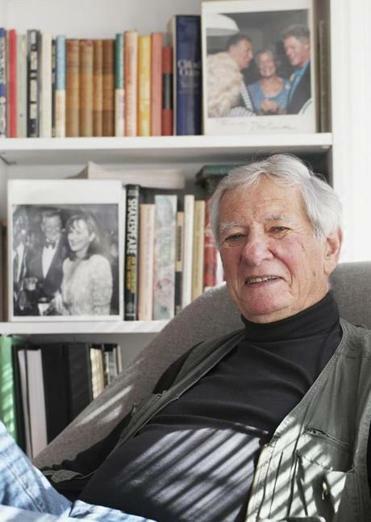 Brustein still maintains a busy pace a decade after he retired as artistic director at the ART. He’s currently writing the book and lyrics for a klezmer musical, “King of the Schnorrers,’’ which is slated for a workshop at ArtsEmerson next season. The final play in his Shakespeare trilogy, “The Last Will,’’ will be co-produced early next year by Boston Playwrights’ Theatre and Suffolk University. He has also written a short play for BPT’s upcoming Boston Theater Marathon, titled “The Comfort Station,’’ which Brustein describes as a vision of the future in which the Tea Party has turned into a Boston militia and members of the Occupy movement have taken over Starbucks. Beyond all that, he is still teaching (at Suffolk University, where he holds the title of Distinguished Scholar in Residence), still advising young writers (“I’m getting more plays, novels, playlets, stories, sent to me now than ever in my life before,’’ he says), and still thinking hard about theater, the art form to which he’s devoted his life. Q. Happy birthday in advance. So why aren’t you resting on your laurels? A. To tell you the truth, I’m in a very ambivalent position because I don’t think I have laurels. That’s one of my problems; I feel I have to continue to pursue the race, because I haven’t gotten there. I know that’s foolish, and people tell me it’s foolish. Rocco Landesman, who’s now head of the National Endowment for the Arts, says: “Bob, relax. You made it.’’ [Laughs] I don’t believe it. Q. Is that constitutional, temperamental, a feeling of unfinished business? A. Psychologically, I can’t account for it. I’m glad for it, because it gives me the impetus to do things I love, to continue to do them. Q. A lot of labels — avant-garde, postmodernist, etc. — have been attached over the years to the kind of theater you championed, created, and generally favored. How would you describe your aesthetic, both at the ART and at Yale Rep? A. We were trying to liberate American theater from its British overseers. We were trying to find an American style for the classics. … I think the greatest theater is that which combines the low and the high. One thing I can’t stand is the middle. When we get really lowbrow — Bert Lahr, a comic genius, in “Waiting for Godot,” which is a highbrow play — you’ve got the best combination. And that’s really what I was looking for. I was looking for the energies of popular theater applied to traditional work. I was also looking for new American plays. This was a very important function of ours, to encourage and develop new American playwrights. Q. This is kind of a sweeping question, but I know you’re capable of a sweeping answer, so I’ll just ask you to give me your appraisal of the current state of American theater. A. I’ll give you a sweeping statement, and regret it the moment after I say it. [Laughs] I think the American theater reflects America now, as everything that happens is beginning to reflect America — one-percent America. The fact is that our values have somehow gotten very skewed, and we’ve gone back — if we ever left it — to the notion that success is the highest value in this country. Not integrity, not quality, not intelligence, not spirit, not soul. Success, financial success. And this is a heartbreaker because this country was unlike any country, with the possible exception of ancient Greece; it had the chance to approach an ideal state, and it’s gone. We’ve lost it. Success seems to be the one criterion of achievement. Q. And you see that reflected in the theater how? A. Oh, boy. Well, look at Broadway. Broadway is filled with revivals of successful musicals. Some of them are good, some of them are bad, but this is pure entertainment. I love entertainment, but entertainment has got to be a serious effort to investigate the American soul through its theater. Novelists understand this, poets understand this, and for a while the playwrights really understood it. Tennessee Williams, and particularly Eugene O’Neill, were great, great writers who went right to the heart of what was wrong with the American soul, and we don’t have that anymore. And if we do, it’s not making it on the stage. Q. What happened? I mean, certainly O’Neill, Williams, Arthur Miller enjoyed popular success. A. Look at the price of the ticket. Four hundred and fifty dollars for a ticket? Who can afford that except a businessman taking out a prospective client? You know, for his entertainment? Or tourists, who want to really do up the town, and have a whoopee good time. I sound like a Puritan; I love good times. We create work that gives you a good time. But it’s got to have some deeper resonance. And if it doesn’t, we’re losing our soul. Q. How about regional theater? A. Same thing. And it’s not their fault. It’s the fault of the loss of financial support. I mean, after the Mapplethorpe and Serrano scandals [in 1989], Congress really wanted to wipe out the NEA, and they still want to. They just don’t like it because it’s the arts. They don’t like it because it’s humanities. And I would venture to say that they don’t like it because it impinges on this notion that success is everything. It is a criticism of that. [If] you lose foundation money — the foundations are incredibly important to the development of the arts, but they’re also fickle. They don’t want to stay with anything very long. Q. You’ve had such a multifaceted career. As a critic, you’ve been forceful, sometimes pugnacious. In terms of style, was your strategy to bring attention to your arguments through the ferocity with which you expressed your opinions? A. Well, it’s a good question, but to tell you the truth, honestly, I was never aware of preparing a style for the opinions. It came out of the way I was feeling at the time. And, you know, sometimes the level of frustration reaches a certain point where it begins to express itself in the tone. On the other hand, I think I was much tougher as a kid than I am now. I want to find something I can get behind and push and support.